with answers that we hope will be helpful with questions that you might have! What is the shelf life of Miso Master Organic Miso? To find the shelf life of our American-made, organic Miso Master Miso please refer to the "Best By" date on the bottom of the miso tub. This "Best By" date reads month-month day-day year-year. Once opened the miso will be at its peak of flavor and freshness through that date. Is is OK to boil Miso Master Miso? Our American-made, organic Miso Master Miso is a live, unpasteurized food filled with beneficial micoflora and enzymes that will not survive boiling. So for optimal health benefits of miso, it is best to add your miso to dishes below the boiling point, and avoid pouring boiling liquids over miso. Are your Great Eastern Sun Products and Miso Master Miso GMO-Free? As supporters of organic and natural products, Great Eastern Sun sources organic and non-GMO ingredients for our 9 Brands. Can you tell me if your Miso Master Miso is Gluten-Free? Why don't we use glass jars for our Miso Master Miso? Our American-made, organic Miso Master Miso is packaged in food-grade, BPA-free recyclable plastic tubs because their lighter weight allows us to keep the cost of our miso at an affordable price. Is Miso Master Miso 100% vegan product? Yes! Our American-made, organic Miso Master Miso is made with 100% plant-based ingredients. No animal products or derivatives are present in the miso or in our miso production, processing or facility. Where can I buy Miso Master Miso? Where can I find recipes for Miso Master Miso and Great Eastern Sun products? 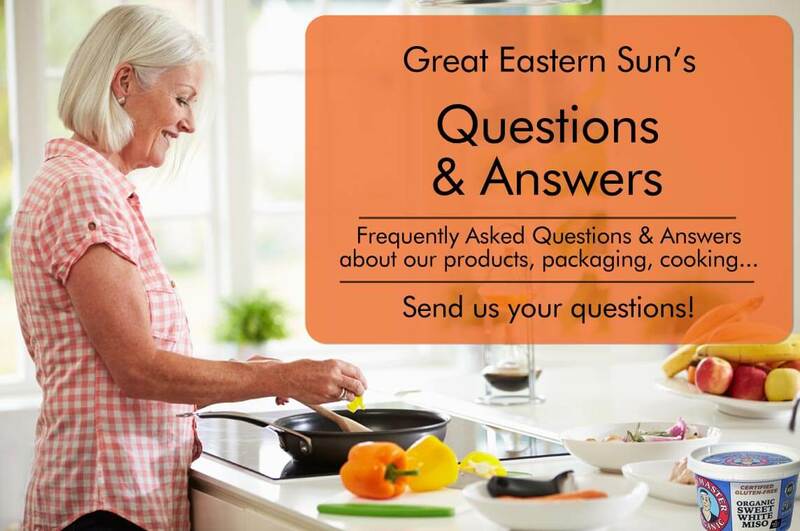 How can I learn more about Great Eastern Sun products/brands? We are glad that you asked. We have Great Eastern Sun Product Flyers available for our 9 Brands for you to learn more about our products. Additionally, each product page includes a tab below the product listing titled "Description" with further details about that product. You can also sign up to receive our Great Eastern Sun Healthy Table monthly eNewsletter with product spotlights, healthy recipes, exciting giveaways and more! Do you have a recipe for making homemade sushi with your Emerald Cove Nori? Homemade sushi is easy to prepare and a super fun meal to make with family and friends joining in. We have some recipes for you to try in Great Eastern Sun's Healthy Recipe Collection including Stuffed Nori Cones, and Soba Nori Rolls. There's also a great sushi book titled, "The Complete Book of Sushi" by Hideo Dekura, Brigid Treloar and Ryuichi Yoshii for the more serious sushi fans who wish to explore the ultimate in creative homemade sushi rolling recipes. Emerald Cove Organic Toasted Nori is Certified Organic, Certified Kosher and Non-GMO Verified. Happy, homemade Sushi making! What are the health benefits of shiitake mushrooms? Besides their amazing flavoring magic, Shiitake Mushrooms are a powerhouse of healthy goodness. To learn more about what makes these popular culinary delights so amazingly good for you, check out this informative article, "Shiitake Mushrooms: 8 Scientifically Proven Benefits" by Dr. Josh Axe. Our Emperor's Kitchen Organic Shiitake Mushrooms are certified USDA Organic and are convenient way to have shiitakes on hand for your healthy daily meals. Where can I learn more about your Haiku Organic Teas? with two full grams of 100% USDA Certified Organic Sencha Tea. I have a blog and would like to test and share your products. Who do I contact? Great! We love working with bloggers and authors. Please email us a note on our Great Eastern Sun Contact Form and tell us more about your blog and we will be sure to send you our Bloggers & Authors Collaboration Guidelines and then we'll connect for a possible collaboration and perhaps join us with one of our Great Eastern Sun Great Giveaways.